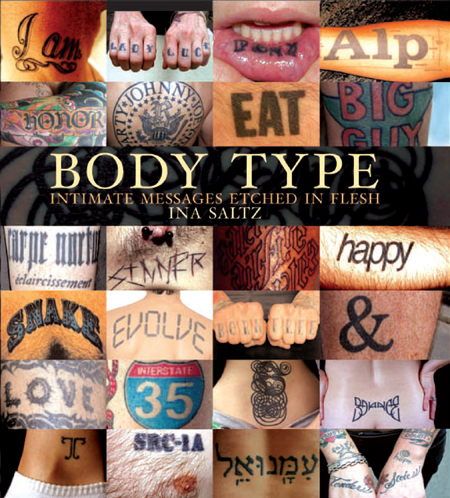 “BODY TYPE: Intimate Messages Etched in Flesh” is the first book devoted entirely to typographic tattoos. “BODY TYPE 2: More Typographic Tattoos” is the sequel: more amazing photographs of those who have chosen to represent their deepest feelings with the permanence of ink under the skin, and the stories behind them. Called INSPIRING, SHOCKING, AND VOYEURISTIC...“BODY TYPE” explores the ideas and emotions behind this indelible commitment. From Shakespeare to Radiohead, from Dante to James Joyce, from celebrations of love to homage and memorial, the wide breadth of messages captured provides insight into the human condition. The two volumes of BODY TYPE are not only for tattoo aficionados, but also for all those who love the written word. BODY TYPE 1 and BODY TYPE 2 are full color; hard cover with jacket, 192 pages with over 200 photos (and the fascinating motivations behind the tattoos). 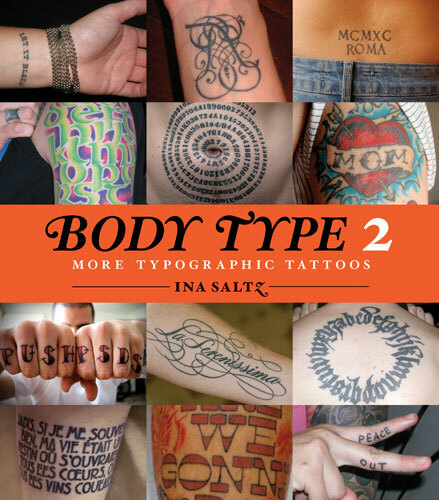 DOWNLOAD THE STORY OF BODY TYPE (or HOW I BECAME A TATTOO EXPERT) by Ina Saltz (a chapter in a new book on the history of tattooing in New York City).